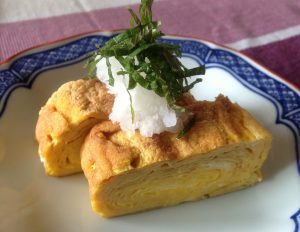 Tamagoyaki is a Japanese omelet. It is one of most basic dishes but still very popular, specially for Bento, because of the colour. This yellow colour brightens up the the other foods and ingredients. The main difference when comparing it to the omelet is that you use sugar. My recipe is not very sweet, however, so if you prefer it sweeter you can add more sugar. But with more sugar it becomes much easier to brown and burn, so watch it carefully while cooking. The tamagoyaki flavour really depends on who is making it. It tends to be sweeter and more salty in the Tokyo area. Many recipes uses soy sauce instead of salt. But I prefer not for the lovely yellow colour. Another of my favourite tamagoyakis is dashimaki tamago. This recipe uses a little bit of dashi (Japanese soup stock), which makes the flavour and texture more gentle and lighter. It’s delicious to eat with daikon oroshi (grated white radish) and a touch of soy sauce! You need a special square pan to cook this long square shape. If not, you can try to make it with big frying pan and use only the centre of the pan. 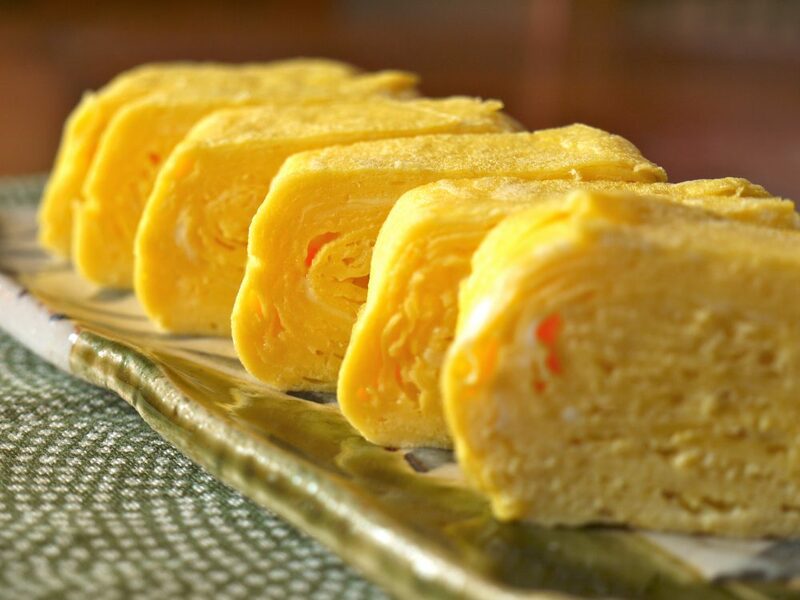 Pour the egg liquid into a rectangle shape, and roll it using the same method as for ordinary Tamagoyaki. It can be eaten by itself, but is also used for a variety of sushi such as Maki (roll), Nigiri, Chirashi and others. Break eggs into the bowl, beat them lightly (NOT whisk! ), then mix with sugar, mirin and salt. Heat a square Tamagoyaki-pan with medium heat, grease the pan, then pour the egg-liquid into the pan for one seat. When it's cooked half way, lift up one side with chop stick and start to fold. When it finished to fold, move "tamagoyaki" to the one side, grease the pan again. Pour the egg liquid again, repeat to cook and roll until the egg liquid finished. Turn off the heat, leave the tamagoyaki a little while and cook in residual heat.